A Florida woman accused of threatening the parent of a boy killed in the Sandy Hook school shooting because she thought it was a hoax pleaded not guilty Monday and was barred from visiting websites that promote such false conspiracy theories. Lucy Richards, 57, entered her plea in Fort Lauderdale federal court after a public defender was appointed to represent her. The lawyer, Michael Spivack, declined to comment after the hearing. Richards was arrested Dec. 7 in Tampa on four felony counts of transmitting threats to Lenny Pozner, father of 6-year-old Noah Pozner who died in the 2012 mass shooting in Newtown, Connecticut. Richards lives in Brandon, near Tampa, but threats were received by Pozner in Palm Beach County, according to court records. Each charge carries a maximum five-year prison sentence. An emotional Newtown School Superintendent Janet Robinson talked with NBC Connecticut about the impact the mass shooting at Sandy Hook Elementary has had on her community. Richards, who is free on $25,000 bail, entered the courtroom wearing furry slippers and using an aluminum walker. 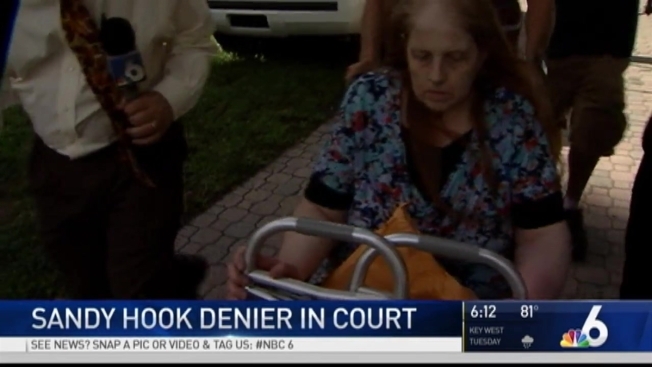 She told U.S. Magistrate Judge Barry Seltzer she is on disability and has not worked in more than a decade when she was a waitress. She spoke softly in answering the judge's questions, telling him she is not married and has no children, and that she had only been arrested once before for stealing two sandwiches from a grocery store. Others linked to the Sandy Hook massacre have reported harassment by conspiracy theorists who argue the event was staged to erode support for Second Amendment gun rights. Richards, however, said she owns no weapons. "I've never touched or owned a gun," she said. The four threats were made Jan. 10, according to authorities, and included messages that said, "you gonna die, death is coming to you real soon," and "LOOK BEHIND YOU IT IS DEATH." Another threat said, "there's nothing you can do about it," according to court documents. Federal prosecutors successfully got Richards prohibited from visiting conspiracy theory websites because she told investigators after her arrest that she had been viewing one when she sent the messages to Pozner, said Assistant U.S. Attorney Karen Gilbert. "That's what she got angry over, which led to the conduct in this case," Gilbert said. "It's these specifically I'm looking to restrict. I'm not looking for general news websites." Seltzer also ordered Richards to have no contact with Pozner or anyone else connected to the Sandy Hook killings. Pozner has publicly sought to debunk conspiracy theories that claim Sandy Hook and other mass slayings were staged by the government as part of an anti-gun agenda. In an interview last week with The Associated Press, Pozner said ignoring the deluge of hoaxes posted online about his son's death over the last four years is impossible and only emboldens people to threaten him. "This is such an antiquated concept — 'don't feed the trolls,'" Pozner said. "All the people that have said that and ignored it all are responsible for this problem festering and becoming even worse." Pozner launched a website this year, www.honr.com, to expand his network of volunteers who report hoax-related harassment on social media and flag content that violates the terms of service for sites such as PayPal. "All of these companies are not defending victims," Pozner said. "They need more accountability."